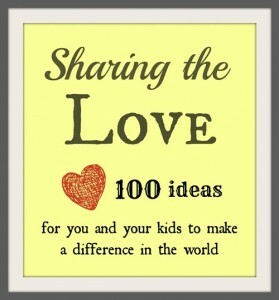 This is the last article in my series Sharing the Love: 100 Ways for You and Your Kids to Make a Difference in the World. 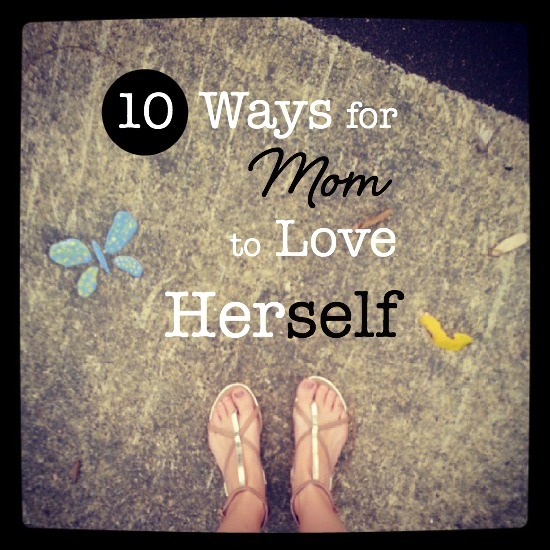 After listing many ideas for showing your kids love, and extending that love out to others, I would now like to end with some ideas for you to show love to YOURSELF. Why? Because you are no less important than the people around you. Yes, that’s right. You deserve to be loved and cared for, as well. And even if you question if you are really worth some extra time and attention (which you ARE!! ), the way we treat ourselves goes beyond our own individual day to day lives. We are modeling self-care to the little ones in our care. Would you like your children to copy your habits and take care of their own grown-up selves the way you take care of yourself? I, for one, know I need to do a lot of work in this area. If I want my children to respect themselves and look after their own well-being as they become adults, I need to care for myself. I need to show them how to love themselves. Don’t you love it when your kids light up when they see your face? Try putting on a smile right now. Do you feel a little burst of positive energy? This is a great way to start the day… smile to yourself and to your family. Sometimes putting yourself in a good frame of mind is as easy as that. Try to make yourself happy, just as you would try to bring a smile to someone else. A lovely exercise to remind yourself of how wonderful life is, is to think of what you are grateful for. Loving the little things in your life is a nice way to remind yourself how many blessings there are around you. Give yourself the gift of time to remember. Would you encourage your kids to become stressed with extra duties or over-scheduled with commitments? Then don’t put yourself under the same pressure. Be loving to yourself by being realistic about what you can handle. Remember, when you say “no” to something (such as a volunteer job), you are saying “yes” to something else (such as some much needed family time). Treat your body with care. Eat healthy foods. Drink enough water. It may seem simple, but when we are busy with a million other things it can be easy to forget. Your long-term health is worth the daily attention. Physical movement allows us to de-stress, clear our minds and sleep better, among other benefits. Just taking a 20 minute walk or stretching for a few minutes is a great way to start. Expending the extra energy for more peace and well-being is time well spent. Do you guard your kids’ sleep? I sure do! I know they cannot function their best when they do not have enough rest so I arrange our schedule to make sure they get enough sleep. Why should I expect any more of myself? Sleep is necessary to human existence and allowing myself rest is showing respect (and love) to my body. Take time to understand your feelings and talk about them. Are you feeling frustrated? Overwhelmed? Unloved? Sometimes moms can be so busy caring for the emotional needs of others, it can be easy to overlook their own mental well-being. Recognizing what is going on and taking the time to talk to someone about it, can be very healing. Give yourself permission to be vulnerable to someone else. You aren’t perfect and sometimes expressing emotion is the only way to work through it. Remember that you are learning every day – and forgive yourself. You would not expect your child to know everything. Why feel guilty when you missed something, or misunderstood something, or did not do what you *should* have done? Accept your life as a journey and realize that you are only human. If you make a mistake, forgive yourself and move on. Everyone makes mistakes and being a true friend to yourself means that you will forgive yourself, learn from your experience, and do better next time. Anyone who loves you would do the same. Don’t refuse love because you don’t feel you are worth it. Don’t feel guilty if you need to take some time to take care of yourself, or put yourself down if you ask someone for help. Receive love as you would like someone else to receive it. Be gracious, be thankful, and allow yourself to be lovable. You will likely be able to share more love with others when you feel loved, as well. When your kids hug you and say you are the best mommy in the world, embrace them and believe it — because you are the best mom for them. And you are loved, no matter how unlovable you may feel at times. Show yourself the love you deserve… so you can grow and show love to others. 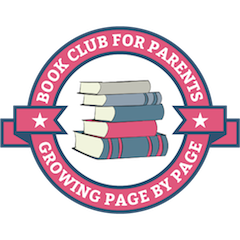 Follow my posts by joining me on Facebook, Pinterest, and Twitter, and don’t forget to sign up for my monthly newsletters where I’ll review the past month’s posts and share some other favorite resources as well.